Sometimes you come home to a nearly empty fridge or fresh produce, but to lots of ingredients in your freezer/ pantry. Then this dish is easy to whip up in about 30 minutes. Squeeze the excess water from the tofu above the sink. Cut the tofu into bite size cubes. Season the tofu cubes with the soy sauce, turmeric, asafetida, black pepper & chili powder coating all cubes evenly. Set aside. Heat up water for the pasta. Heat up oil in a frying pan or wok and add the seasoned tofu cubes. Stir fry for about 8-10 until golden. Cook the pasta according to directions. Add soy cream and stir well. Drain the pasta and quickly add some cold water to stop cooking process. Add the pasta to the sauce and mix well. Season with salt & black pepper to taste. 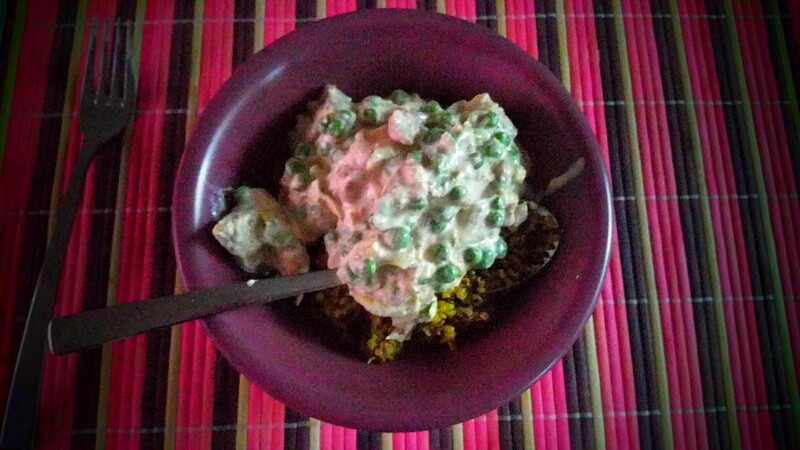 Categories: Vegan recipe, Yogi food | Tags: recipe, tofu, vegan | Permalink. One evening we were having friends over for dinner and I actually wanted to make my delicious eggplant tempeh gnocchi recipe, but I couldn’t find any vegan gnocchi (and didn’t feel like making them myself) whereas I had all the other ingredients. After some quick searching online I improvised and came up with a parmigiana alla melanzana/ lasagne combo. It was relatively quick. Wash then cut the eggplant in slices (lenghtwise) of about 1 cm thick. Generously sprinkle salt on each layer and leave in a strainer (with a plate underneath) to ‘sweat’ for about 15 minutes. Drain the tofu (using plates method OR squeeze using your hands in the sink). Press the tofu into tiny bits (using a kitchen machine OR a potato masher). Season the tofu with the spices and mix well, add some olive oil so the spices absorb nicely (don’t use the nutritional yeast yet). Heat some coconut oil and stir fry the tofu until slightly crispy. Add the frozen spinach (or fresh if you prefer but then you’ll need a lot more) and leave to simmer until the spinach is done. In the meantime, rinse the eggplant, then dry with a clean kitchen towel and slice the flesh a few times diagonally. Place the eggplants onto a baking sheet. Brush each slice with olive oil and season with a little bit of salt and pepper, both sides and place in the oven for about 20 minutes, turn them after 10 minutes (or until nicely cooked). Add the tomato sauce to the tofu/ eggplant mixture and let it simmer. Mix in the cream, nutritional yeast and fresh basil, season with salt & pepper if necessary. Take 1 big or 2 medium sized oven plates and place a thin layer of the tomato sauce, add slices of eggplant, repeat until done, ending with a layer of tomato sauce and cover with mozzarella. Add foil and place in the oven for about 20 minutes, take away the foil after 15 minutes. Serve with simple green seasonal salad (purslane, lettuce, dandelion, …) and a lemon-olive oil dressing. Categories: Yogi food | Tags: eggplant, lasagne, recipe, spinach, tempeh, tofu, vegan | Permalink. Nothing like a filling and savoury homemade miso soup when you don’t have much time or ingredients to cook. Put the Kombu in the boiling water and leave to simmer. In the meantime, drain the water from the tofu (using either your hands to squeeze the tofu (fast version) or placing the tofu between two plates and putting a heavy object on the top plate and wait 30 minutes to free the excess water). Cut the tofu into cubes (approximately 1-2 cm). Mix the other ingredients for the tofu cubes in a deep dish. Add the tofu cubes to the mixture; making sure all sides are well coated. Wash, then slice the vegetables in julienne. Peel the ginger and slice. After the Kombu has simmered for about 10 minutes, add the ginger, carrot, fennel and turmeric, leave to simmer. In the meantime, fry the tofu with coconut oil in a frying pan or wok until it’s nice and crispy. After 5 minutes of simmering the Kombu and the vegetables, add the zucchini. After 5 more minutes add the noodles (mine needed to simmer 5-6 minutes in boiling water). In the meantime, prepare 1 tsp of miso with some hot water in two separate bowls. Once your noodles are perfectly cooked (al dente), turn of the heat source, take a skimmer (‘serving spoon with holes’) to take out the noodles and vegetables and divide them over the 2 bows with miso. Mix well. Add some of the stock. Finish with the fried tofu and some black pepper. You can keep the stock for soup or sauce, in your freezer or fridge (couple of days). You can use any vegetable you like, I used what I had in my fridge. Also, if you don’t want to fry the tofu, you can simply cook it along with the vegetables for about 10 minutes. Important: don’t leave any noodles in the stock to heat up at some later stage: as they will become all mushy. So if you cook for more than one meal, simply boil your noodles in a separate pot and drain them, rinse with cold water and use the desired quantity. I did an easy version in order to save time and water. Categories: Yogi food | Tags: ginger, miso, recipe, sattvic, soup, tofu, vegan | Permalink. Palava (or Palaver) sauce is a typical West African dish, which is generally made with lots of fish and meat. In this veganized version, I’ve simply omitted those proteins, which I serve on the side: seasoned and fried tofu cubes. I eat this dish with white (Basmati) rice and a serving of boiled or fried plantains. This European version uses swiss chard instead of the cocoyam leaves (Kontomire) that normally constitute the recipe. Heat the oil in a wok and fry the onions until golden. Add the tomatoes, pepper to taste and the chillies (hot peppers). Add the spinach. Cover and simmer on low heat for 10-15 minutes or until the spinach is soft and cooked. Stir regularly. In the meantime prepare the egushi (or regular pumpkin seeds): rinse and dry and then grind them to a powder form. Add the egushi and stir them into the sauce. Cook for a further 10-15 minutes on low heat. Serve hot with boiled rice, yams, plantains, gari (coarse cassava flour), Banku (cornmeal dumplings) or any root vegetable, roasted, boiled or grilled. Note: Palm oil is red oil from the red, tropical, palm kernel and is linked to a myriad of ecological and ethical scandals. Please try to find an organic and Fairtrade version or substitute with organic, Fairtrade coconut oil and some turmeric powder (this will alter the taste of your Palava sauce). Drain the water from the tofu (using either your hands to squeeze the tofu (fast version) or placing the tofu between two plates and putting a heavy object on the top plate and wait 30 minutes to free the excess water). Cut into cubes (approximately 1-2 cm). Mix the other ingredients in an baking dish. Put the dish in the oven for about 20-30 minutes or until the tofu is nice and crispy (you can also fry it in coconut oil in a frying pan). Serve as a side dish to your palava sauce. Categories: Yogi food | Tags: egushi, Ghana, recipe, spinach, swiss chard, tofu, vegan, West Africa | Permalink. On a night when I didn’t have many fresh vegetables left, I took whatever I found in my fridge, freezer and pantry to whip up this yummy dinner. It was nutritious and filling. You can substitute the vegan chick’pieces by tofu or tempeh, but make sure to marinate it at least 30 minutes before using it (as to soak up the flavour of your sauce). Rinse the quinoa, set aside. Peel and cut the ginger root in small pieces. Cut the leek (rings) and wash (sieve). Boil 2 cups of water (for the quinoa). Fry the ginger for 1 minute, add the rinsed quinoa and stir fry for another minute. Add 1 tsp of turmeric, a pinch of salt, stir. Add 2 cups of boiling water and let it simmer for about 15 minutes until the quinoa is perfectly dry cooked. In the meantime cut the vegan ‘chick’pieces in smaller strips, add the tamari in the package and stir to evenly coat all the pieces. Heat up some coconut oil in a frying pan or wok and add the ‘chick’pieces, stir fry for a few minutes until golden. Add the leek and stir fry for a few minutes. Stir in the frozen green peas, leave it to simmer for a couple of minutes until the peas are cooked. Add nutritional yeast, salt and pepper to taste. Serve the quinoa and add the sauce on top. Categories: Yogi food | Tags: curcuma, leek, quinoa, soy, tamari, tofu, vegan | Permalink. Quiches are great food to make ahead when organizing a dinner party, you can freeze them or prepare the day before and warm them up before your guest arrive. Serve with a simple green salad with some cucumber or cherry tomatoes and a olive oil/ mustard/ lemon juice dressing, garnished with some toasted sunflower and/ or pumpkin seeds. The vegetables can be varied according to the available seasonable produce. Blanch, stir fry and season your vegetables before adding them to the tofu mixture and putting the quiche in the oven. Prepare the crust: sieve the dry ingredients in one bowl, mix the wet ingredients in a separate smaller bowl. Add the wet ingredients to the dry ingredients, use a fork to mix. 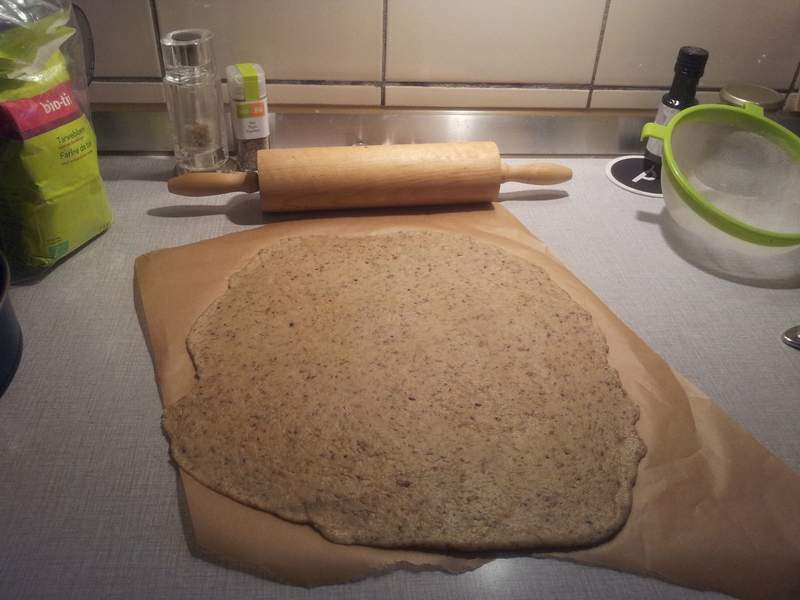 Knead lightly, then roll into a circular shape, big enough to reach across the bottom and the sides of a 26cm pie dish. Add non-stick paper to your pie dish, put the dough in the dish & refrigerate while making the filling. Preheat the oven to 200°C (I use gas oven 6). Wash and cut the broccoli into small florets (try to use as much as possible from the broccoli, you can also use the stem). Boil for 2 minutes (‘blancher’) and rinse with cold water, set aside. Cut the leek in rings, wash and stir fry for a couple of minutes in some olive oil. Add the blanched broccoli and stir fry for 2 more minutes. Add 1 tsp of curcuma and 0.5 tsp of asafoetida, a pinch of salt en fresh pepper. Set aside. Put the crust in the oven, blind bake it for about 15 minutes. Make the filling mixture in a food processor or blender: blend the tofu with the rest of the spices, nutritional yeast and enough soy milk to make it into a creamy mixture. Add the creamy mixture to the vegetables. Take your crust out of the oven, lower the heat to 180°C (gas oven 5). Add the vegetable/ tofu mixture and put in the oven for about 30-35 minutes. 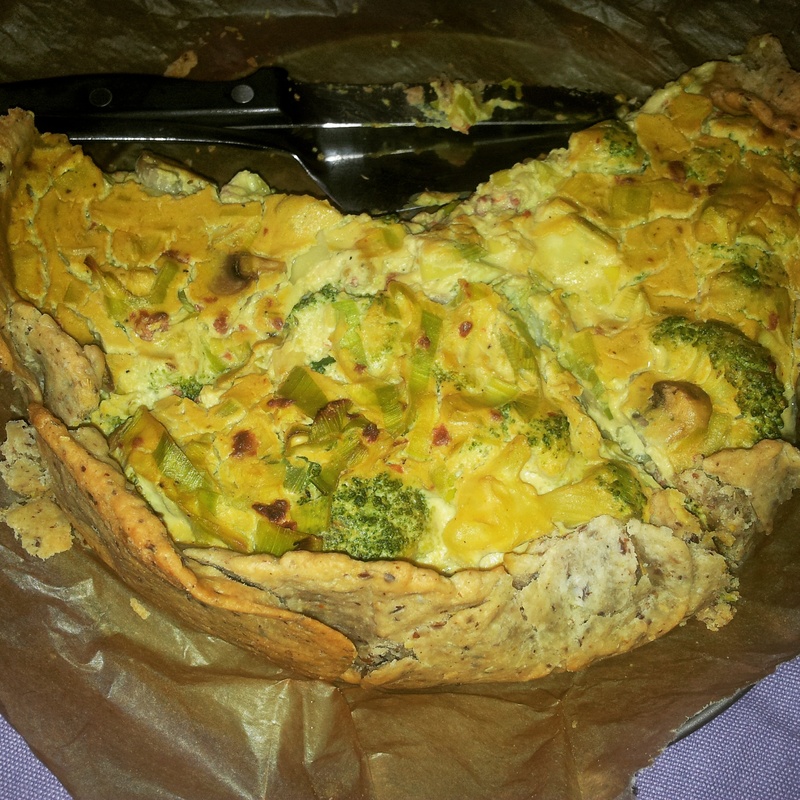 Take your quiche out of the oven, and leave it to cool off for about 5 minutes before serving it with the salad. Categories: Yogi food | Tags: asafoetida, broccoli, curcuma, leek, olive oil, recipe, tofu, vegan | Permalink. I love quiches and especially this simple version that’s also gluten-free. Mix the cashew nuts, asafoetida, nutritional yeast, curcuma and 2 tbsp of the silken tofu in a blender till it becomes soft (sauce like) consistency; add the rest of the silken tofu and blend it all together. Add salt and black pepper to your taste. Set the tofu mixture aside. Clean and slice the mushrooms. Wash and slice the leek and spinach. Stir fry the leek for a couple of minutes before adding the mushrooms and finally the spinach and season with salt, pepper and some dried parsley. Put the vegetables in a baking dish, pour the tofu mixture over it and put in the oven for about 30′. 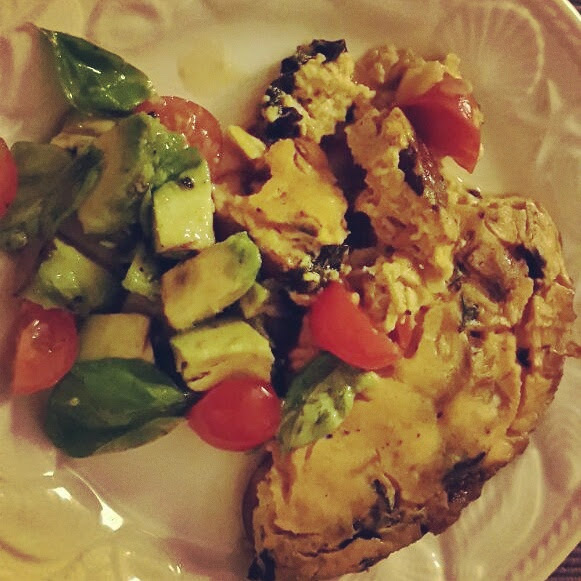 Serve with a green salad, or an avocado/ tomato and basil salad (see picture). Tip: you can substitute the used veggies with any vegetable that you like, just adjust the cooking time to be sure they’re tender when they go in the oven. Categories: Yogi food | Tags: leek, mushrooms, spinach, tofu, vegan | Permalink.